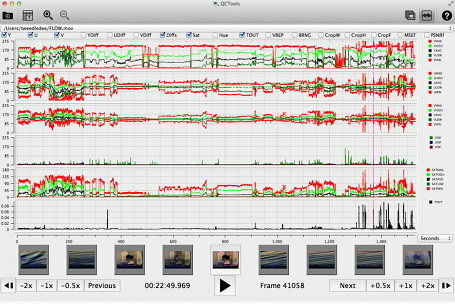 QCTools is a software tool that helps users analyze and understand their digitized video files through use of audiovisual analytics and filtering. Funded by the National Endowment for the Humanities and the Knight Foundation; designed and led by Dave Rice and the Bay Area Video Coalition; developed by MediaArea, Fabio Utzig, Alexander Ivash. MediaArea was involved in the initial development and provides binaries for all platforms. Mean Square Error (MSEf) differences per frame. The QCTools preview window is intended as an analytical playback environent that allows the user to review video through multiple filters simultaneously. The playback window includes two viewing windows which may be set to different combinations of filters. It is Open-Source software which means that end users and developers have freedom to study, to improve and to redistribute the program (GPLv3 license for the whole program, 3-Clause BSD license for the code developped by BAVC).